I love my YSL Gloss Stain Violet Edition and actually think it is worth the price, but it is a different story if I am willing to spend on another one soon. Like many of you, I was very excited about the new Wet Shine Stain from L'Oreal that is supposed to be a nice dupe of the YSL Gloss Stain. With L'Oreal being a parent company of Yves Saint Laurent Cosmetics, I was even more excited. This would mean I can have this hybrid lippie in different colors without having to pay for $32 each! My choice of color, Infinite Fuchsia (187) arrived a couple days ago, and it did not disappoint. I can safely say this Wet Shine Stain is a nice affordable alternative to the YSL Glossy Stain if not identical. I have read there is a difference in color payoffs, for example, Wet Shine Stain is sheerer than Gloss Stain. Some say the L'Oreal version streaks less. I think it depends more on the colors since the pigmentation and lasting power varies often even in the same product. Here is the comparison of the applicators. The shapes are different but basically in the same mechanism, I guess. 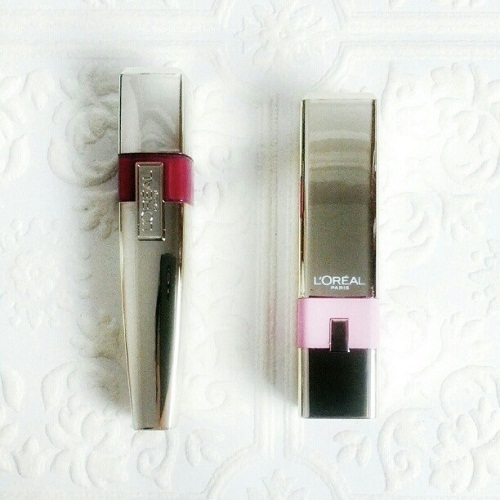 I prefer the L'Oreal one since the smaller applicator is easier to handle. This is just one coat and sheered out. I don't really like vinyl like shine and intense color in hybrid product like this, so this is pretty much how I wear it. As you see in the first swatch picture, Infinite Fuchsia has quite a bit of red in it. Once applied on lips, however, it becomes darker and more plumy. It leaves a lingering stain that I find flattering even after the color becomes softer. Initially it feels a little sticky but it is nothing compared to some of those tacky lip glosses and it goes away leaving my lips comfortable. Here is the FOTD with Infinite Fuchsia. ok, good to know! thanks :) sometimes scents in lip products bother me lol. So pretty! I find that dark color suits you very well :) Can't wait to find these in my area! but the L'Oreal ones are more faintly scented and it goes away after a while. See, this is why I don't buy expensive cosmetics that often. I'll be sure to keep a lookout for these in the store! it is also my reason to love drugstore makeup as well. wow that's a very pretty color on you Lena! i've ordered some more and can't wait to try those as well. I love that these are an affordable option available in the drugstore. pretty! i'm curious about them but definitely don't need more lip stuff! Are the loreal ones scented like the YSL ones? haha Mie, you are too funny! i really think this would be a big hit product in the spring, though. Great post! You look beautiful! I am really excited for these stains to come out! I really like how the colour of this shade turned out. It looks really great on you. ~Vivi L.
I prefer the look of Violet Edition for the uniqueness of shade, but good to hear that the L'Oreal version is comparable! You look fantastic! i agree there are a couple of dark shades that i NEED to get from the YSL. there is a shade called Berry Persistent form L'Oreal and i think it is close to the Violet Edition, though. i couldn't find it offline, either! i ordered it from target.com and more from drugstore.com. i think there is a BOGO 50% off sale going on as well. Gosh that shade looks lovely on you! You have such lovely fair skin hun! I can't wait till the Loreal Wet Stains arrive here - hopefully they go on sale too ^_^ Your temp tattoo is so pretty~ Are you planning to get a real one? Btw, I didn't know Loreal was the parent company of YSL! Interesting info! Look forward to the other two shades you ordered~! In the swatch they look like they're about the same opacity though! Does it get as opaque as the YSL glossy stain with more layers? Your such a beauty! Infinite Fuschia is on it way to me and I can't wait! I love it on you :-) I'm very pleased with these as well, I find them to streak less than the ysl but the colors change and the qualities differ between them. FYI berry resistant is gorgeous, I think you would love it. i wanted the berry resistant but i was afraid it might be too similar to the YSL violet edition. this fuchsia turns quite dark on me as well. I love them! Did a post on them today too, lol and I actually prefer them over the ysl one because they smell better :p. I do not like that L'oreal came with different versions for Europe and the US, it makes things very confusing! Love the shade on your lips! I am dying to try these, I hope they become available in Australia soon! i agree that it is confusing and sometimes even frustrating!!! i want pretty names for my lippies like you have them there. lol. I like how you darkened your lower lip. Really pretty. I also like the unique-looking brush. i wouldn't think YSL is a must buy unless there is a color you really want in that formulation. They are really similar, though I think I prefer YSL colour a little more. i understand what you're saying. YSL has more of deeper colors and they are so beautiful! It's really pretty! I think if they are similar, I will probably stick to the L'oreal ones unless there is a YSL color I absolutely have to have :P I like them a lot, though! i really love this. YSL has beautiful deeper colors but it is pretty darn close!